Don't use the police to help you discipline your child. There may be some times when you need to call the police on your child, such in the event of safety concerns or illegal activity. But sometimes, parents call the police simply because they want to scare their child into behaving. They don't actually want their child to be arrested. Whether you’re sick and tired of your 8-year-old’s disrespectful behavior, or you want to convince your 12-year-old he should stop picking on his sister, think twice before using the police as a scare tactic. Calling the police reinforces to your child that you don’t have any effective ways to discipline him at home. It shows that you need the police to serve as your backbone. 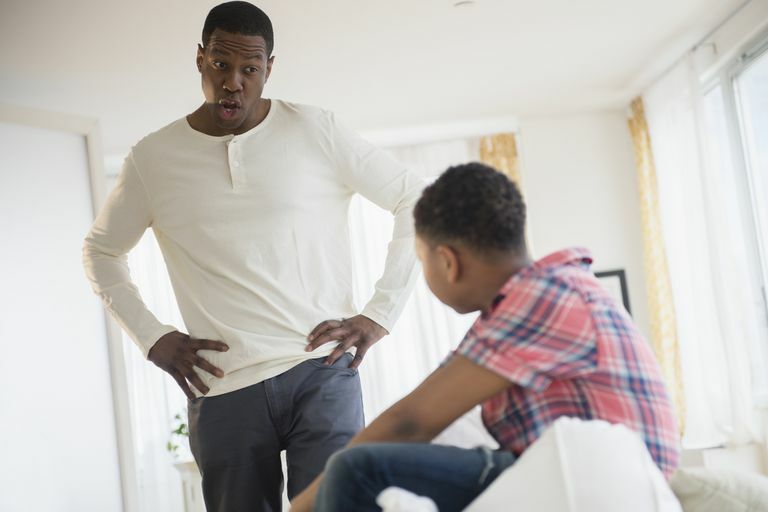 Your child needs to be confident that you are capable of keeping him under control, even when he can't control himself. Turning to the police for backup may cause your child to lose respect for your authority. If you call the police about a mild offense, like your child is refusing to go to time-out, the police aren't going to do anything beyond talking to your child. They may give him a warning or tell him to “behave.” But, ultimately, their intervention may backfire. A child may conclude that having the police called on him isn't a big deal. Losing privileges for 24 hours is likely to be more effective than a brief scolding from a police officer. Scare tactics tend to be effective in the short-term but over time, they lose effectiveness. A child may change his behavior for the days—or even the weeks—following a police intervention. But, as the fear subsides, old behavior patterns are likely to return. Your child will also learn, having the police called on him is only scary for a few minutes. Longer lasting consequences are much more likely to be effective. The role of a police officer is to keep the community safe. Calling the police to your home to scold your child prevents them from doing their duties. They have many other important tasks, like preventing crime and responding to emergencies, that could be a matter of life or death for people in the community. Depending on your child’s age and the severity of the issue, you may not have control over how the police respond to your request. Even if you say you don’t want your child charged with a crime, you may not have a choice. Depending on the laws in your state, charges could be pressed after you make the phone call. Then, the court system will have control over what happens to your child, not you. While there may be times that warrant a call to the police on your child, be aware of the potential consequences. Contacting the police on your child for misbehavior is likely to take a toll on your relationship with your child. Your child may feel a deep sense of betrayal and may not trust you in the future. Unfortunately, a damaged relationship with your child can lead to increased behavior problems. Rather than think you're there to help him, he may assume you're out to get him. If your child’s behavior problems are severe enough that you’re considering calling the police, seek professional help. Your child may have a behavior disorder or may need a different approach to discipline. Unless it's an emergency, speak with your child’s pediatrician and request a referral to a therapist. It’s important to rule out issues like ADHD or ODD, which may respond well to treatment, rather than police intervention. If you're child is actively threatening to hurt someone and he has the means to do it, you need to take action to keep everyone safe. In some circumstances, that may mean calling the police. You may also need to call the police on your child if you become aware that he's been involved in criminal activity. If you find stolen goods or evidence of a crime, contact the police. If you have a troubled teen who is already involved with the justice system, you may have been given some specific instructions on when the contact the police. A curfew violation, for example, may be a serious issue if your child already has legal issues.